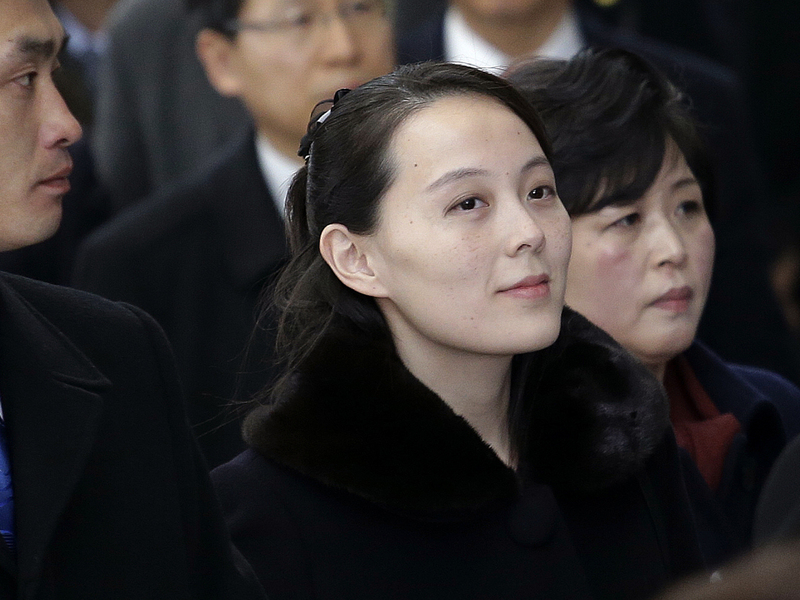 Kim Jong Un's Sister Makes First Appearance In South Korea For Olympics : The Torch The influential sibling to North Korea's secretive leader has also met with South Korean President Moon Jae-in. Kim Yo Jong, sister of North Korean leader Kim Jong Un, arrives at the Incheon International Airport in Incheon, South Korea, on Friday. The sister of North Korea's leader, Kim Yo Jong, and other high-ranking officials from Pyongyang have met with South Korea's president. Their three-day visit to South Korea marks the highest level inter-Korean contact in more than a decade. South Korea's Yonhap news agency also says Kim Yong Nam is "the only member of the communist state's ruling family to have visited the South, at least since the end of the 1950-53 Korean War." The delegation of 22 North Koreans traveled by private plane to the South. In the group was Kim Yong Nam, a ceremonial head of North Korea's government, and Kim Yo Jong, the first immediate member of the dynastic Kim family to set foot in South Korea since the Korean war, which ended in an armistice in 1953. After being greeted at the airport by the head of South Korea's Unification Ministry, the delegation went from Seoul to the Olympic host city of Pyeongchang by high-speed train. The dignitaries are expected to join other foreign visitors — including Vice President Mike Pence and Japan's Prime Minister, Shinzo Abe — at the opening ceremony of the Winter Olympics. The convergence of political figures after painstaking diplomatic work by South Korea has raised the possibility of diplomatic encounters. Pence, during earlier stops on his trip to Asia, has responded to questions about a potential meeting by saying, "We'll see." But he's emphasized the Trump administration's hard-line policy of sanctions and isolating the North. He also brought along a highly symbolic visitor to the Olympics opening — Fred Warmbier. He is the father of an American college student who was imprisoned in North Korea for attempting to steal a propaganda banner. He died shortly after being returned to the U.S. by North Korea in a coma. "Whatever images may emerge against the powerful backdrop and idealism of the Olympics, North Korea has to accept change. They have to abandon their nuclear ambitions. They have to end the day of provocation and menacing," Pence said, during a stop to a memorial for a South Korean ship torpedoed by North Koreans in 2010, killing 46 South Korean sailors.